Opening for the season on the first Saturday in May! Check our new market calendar. Want to sell at the Market? Saturday before Thanksgiving, Ending Day of market. Delicious vegetables, baked goods, meats, and much more available from your local farmers. Be a part of the great celebration and support your local farmer. Unity Market Day is an active farmers' market partnered with other events to create a weekly celebration of rural living in our community. The place to be every Saturday from 9 to 1 is at Unity Market Day at the Unity Community Center. 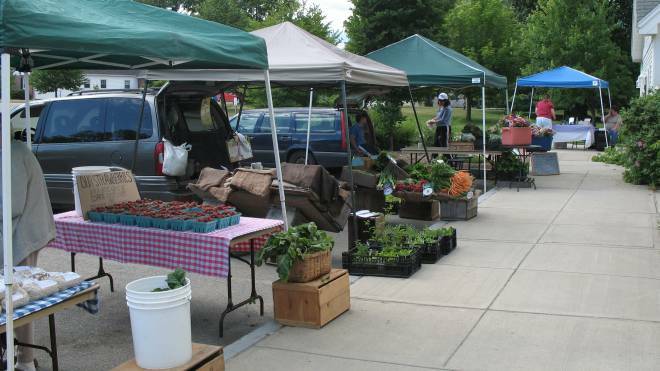 Want to join the Unity Farmers' Market? Unity Market Day is looking for members with milk, cheese and yogurt from cow, sheep, and/or goat milk, perennial plants, flowers, grains, eggs, chicken, honey, and maple syrup. For more info about the market, or if you want to become a member of the market contact Lois Labbe, 27 Organic Farm Road, Pittsfield ME 04967, or call (207) 416-5418 or email lois@snakeroot.net. You can download an Application to join the market and the Market Rules from our Documents Page. Read the Market Rules before printing out and sending in the application. 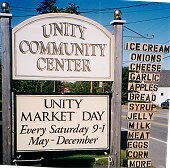 Unity Market Day wishes to thank the Unity Barn Raisers for sponsoring the market from 1999 to 2006. We look forward to a continued warm and mutually beneficial relationship in the coming years.